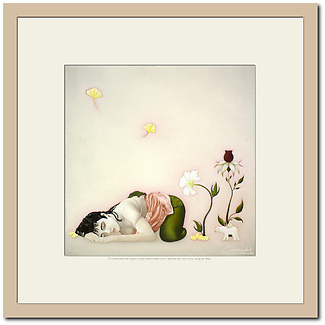 This listing is for a fine art print, titled "Die Sehnsucht". The print will be delivered in a light wooden frame, ready to hang on the wall. "Die Sehnsucht" is German for "longing". This print is a reproduction of a large oil painting (140 x 140 cm), which I made in 2011. The painting has been shown at various private and public exhibitions in Germany, where it continuous to receive consistent positive feedback. You can see the original and read more about it here: original painting.